A beautiful and exquisite carving of a Kuba king figure, the detail is second to none. An absolutely exquisite carving of a Kuba king figure in the representation of king Mbop aMabiinc maKyeen [Bope Mobinji Kena], (1939 – 1969). This figure is dated 1954 by the sculptor who carved his name on the underside of the base. Médar Paul JHedoi (?) 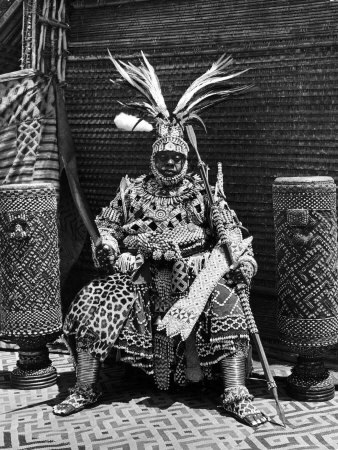 When this figure was carved the carver focused on absolutely every minute detail omitting nothing at all from the traditional hat embellished with tiny carved cowrie shells to the depiction of such detailed areas on the Kuba cloth that is wrapped around the Kings body. It is so precise showing the true pattern that Kuba cloth holds. Finer detail on both the finger and toe nails gives life to this King figure holding a true feeling of how this majestic person would look. A figure resembling what would have been the slave to the king is equally impressively carved missing no detail at all showing great attention from the hair to the shape and design of the garments being worn right down to the highlighted bones and toe nail carving. Carvings of two figures around the base of the figure also depict slaves, with detailed carved bindings to both their hands and feet. Carved with such precision and mastery worthy of only a King within the Kingdom. PROVENANCE: Colonial family acquired this at the end of the 1950’s from Paul Gilman a retired Belgian collector living in Liege who has more than 70 Art objects mentioned in the Guy van Rijn Yale database of African Art. A signed certificate of authenticity accompanies this piece from a Belgian Gallery. Kuba oral histories recall the migration of their eighteen constituent ethnic groups to the western Kasai region of what is now the central Democratic Republic of the Congo by 1568. There they were united within a paramount chieftaincy during the seventeenth century and a new political dynasty came to be embodied by the larger-than-life hero Shyáám áMbúl áNgoong (r. ca. 1630). Following his installation, a new Kuba leader, or nyim, announced his choice of a praise name, geometric pattern, and signature emblem (ibol), which became identifying symbols of his reign. He subsequently commissioned the official ndop sculpture that would serve as a surrogate for his person. During a nyim’s lifetime, his ndop served as his spirit double; following death it was the site for his life force. Paradoxically this genre was designed to make manifest the essence of an individual while deliberately obfuscating physiognomic differences through adherence to an established visual lexicon. Consequently, each leader’s ndop is a variation on a highly unified visual theme not unlike the rich exploitation of pure abstract pattern that is a signature of Kuba aesthetics.